Thanks for everyone’s patience with our java bracket. Despite that, we have 18 entries (3 hand-filled (1 jpg, 2 pdf), 1 ESPN screenshot, 10 CBSSports via our alternate HWCI group, and 4 somehow got java to work) which is only 2 off of last year’s pace with a working site. So now, if the java bracket doesn’t show up, the #1 suggestion on the page is to use our new alternate bracket entry. Looks different but should work on all browsers (in fact, I just submitted a bracket on my iPad Air! — yes, I’m not always anti-Apple). You’ll find the link after submitting the info form at Web Entry. If it’s a wild success, we’ll just replace the java applet with this (reduces 1 click-thru). Alternatively, you can email (ncaa<at>hwci.com) a copy of your completed bracket (phone picture, scan) with name, email, nickname, and total pts in final. PLEASE JUST SEND A QUICK EMAIL W/FIRST FOUR PREDICTIONS BY 3:40 PM) I will donate $2 per entry to a charity which will be Friends of Renee (previous were MathCounts (a record $103 donated by myself and others), American Red Cross, and American Cancer Society). Again details can be found on our homepage but basically, reply to this email the winners of the First Four (4 games: Albany vs Mt St Marys, Cal Poly vs TX Southern, NC St vs Xavier, Iowa vs Tenn) and margin of victory of each (e.g., Xavier by 4 pts). 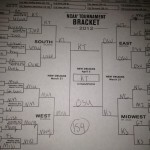 Lastly, you can now view your bracket (if you emailed it to me or submitted via CBSSports, give me a while). 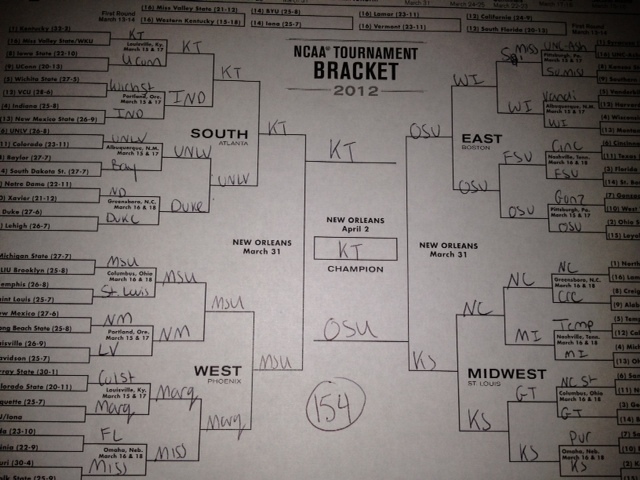 This is important if I entered your bracket, so double-check I didn’t put Tulsa winning it all. Until things are official, nicknames may be funny or slightly off but you should be able to find it in the dropdown box. If you can’t let us know. Took a while, but Syracuse finally ran out of juice. And it knocked Larzby off the top for the first time falling to a tie for 4th and now can’ finish better than 4th. Bigtenfan and Nwspring 1 are now co-leaders. Biggest Luther will try to become only our 2nd ever 2-time champion. Only 10 can win it all and 39 are still alive. And my wife (SpAva) is mad at me because I said I now have to root for her teams, and with Syracuse’s loss, she is out of the running while my The Fabone in 3D is still alive for 5th. When I left you, I was but the learner; now I am the master. Wrong. Louisville ended the game on an 18-3 run to shock Florida and advance to the Final Four. Rick Pitino outcoached former player Billy Donovan after earning an inadvertent technical that led to Florida being up by 11. Seemed like Pitino was yelling his player and the ref thought he was yelling at him giving him a technical (resulting in two extra free throws). Well, 7 picked Louisville (5 picked Florida including now eliminated Gator Glory). 51 are still alive and 11 can win 1st. Somewhat more importantly, the Big East picked up its 13th win for the Bonus competition. Favorites had to hold on but all higher seeds won. Just 12 17 can win it all and 54 are still alive. If you want to know YOUR individual possibilities, post a comment here or on Facebook. An example, here is my 11 (out of 128) possible winning outcomes (The Fabone in 3D). The Big East went 0-2 in the final two games while Ohio St. and Florida advance, keeping Gator Glory happy and alive. Larzby is in first by 5 points. Just 67 can win money (top 6 spots). Two of the top 5 entries lost Michigan St as their champ. Three went 3-1 for the day. Sort of a reverse first half, as Syracuse advances but Izzo’s Spartans don’t, becoming the first #1 seed to fall. Larzby opens up a 5-point lead with his Louisville pick. He’ll need the cushion as he had Duke and Missouri in his Final Four. So thanks to Apple, I had to manually enter several brackets because of Mac issues. Doing this after only a few hours sleep every day something was bound to slip. So there is a 134th entry as pictured, turned in on time and even better, paid for (both her husband and her mentioned there were two entries but it didn’t register with me). So we now have 134 entries. Fortunately, no one got eliminated due to this, so 101 are still alive to win money though I bet some of you wanted to be put out of your misery. The issue was the two nicknames she used were “Buckeye23” and “TheBuckeye23” which with tired eyes looked the same (and the fact she never had entered twice before). But at least it’ been corrected. Actually, I still have one more run to the P.O. Box (mainly to collect checks) so there is still a very minute chance someone actually mailed in their entry (postmarked Thursday AM or earlier). Haven’t had one of those in ages. So standings will be updated later today for 134 entries. We tied a record with 2 entries on Sunday and set a record with 20 entries on Monday — for a total of 22 entries which is 7 ahead of last year’s pace to a record 125 entries. The not so good news is that only 2 new people have entered so we need more fresh blood (preferably those who pick Beach (LB State) to win it all). I am not sure why people feel really good about submitting their entry this early, but you all obviously know something I don’t (which ain’t very hard). Don’t forget to quickly send an email or post a comment on this blog or a comment on Facebook for your First Four for Charity picks (free!). Have family members submit a free entry. Deadline is 3:30 pm today! And don’t forget to watch the games on TruTV.